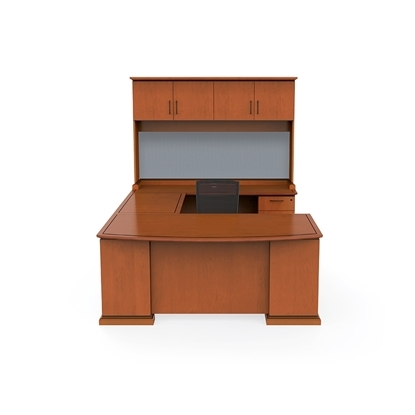 This Mayline U Shaped desk with bow front and wood veneer features a 1 1/2" thick hardwood edge and a hutch with styled glass doors. The Mira series features simple curves that create an elegant setting for any work environment. Perfect for a laptop computer, desktop or tablet. Free shipping on all office furniture. Zira by Global is a contemporary desk series with extensive options to personalize your office or home office. This U shaped desk with mini hutch meets all of your storage requirements. GreenGuard® certified eco friendly design. Free shipping and warranty available on all discount office furniture. Emerald by Cherryman U shaped desk with wood veneer and bow front is made from premium grade quality materials. This desk features a 1 1/8” thick top and a solid wood profiled edge on all four sides. In addition both tops and panels used a 3 ply balanced construction. Free shipping and warranty available on all discount office furniture. The Emerald U shaped wood veneer desk made from premium grade quality materials from our large Cherryman collection. This desk features a 1 1/8” thick top and a solid wood profiled edge on all four sides. In addition both tops and panels used a 3 ply balanced construction. Free shipping and warranty available on all discount office furniture. The Emerald wood veneer desk is made from premium grade quality materials from our large collection from Cherryman. 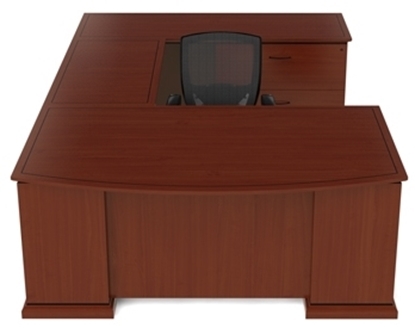 This U shaped desk features a 1 1/8” thick top and a solid wood profiled edge on all four sides. In addition both tops and panels used a 3 ply balanced construction. Free shipping and warranty available on all office desks. 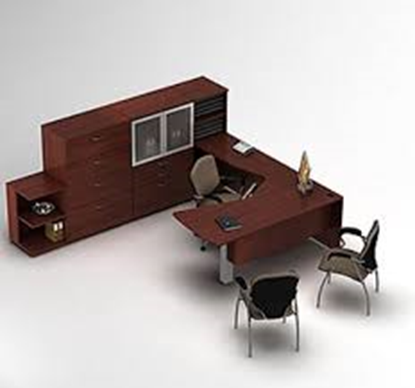 The Mayline Napoli U Shaped Desk is an Italian influenced design with select wood veneers. This Napoli desk uses a 14-step finishing process and quality construction. Great style and function at a very affordable price. Distinctive metal framed hutch doors and bold back panel sets this beautiful office desk series apart. Free shipping on all discount furniture. The Brogan U shaped executive desk with wood veneer and corner piece provides an image and space that you will appreciate. The corner piece is a very convenient spot for a laptop or desktop computer. The decorative molding and polished brass hardware add a touch of elegance. Ball bearing drawer suspensions allow the drawers to operate smoothly. JSI Brogan offers traditional luxury affordably priced with decorative molding and cherry worksurfaces or hand-rubbed walnut worksurfaces. Certified eco friendly design. Free shipping on all office furniture. 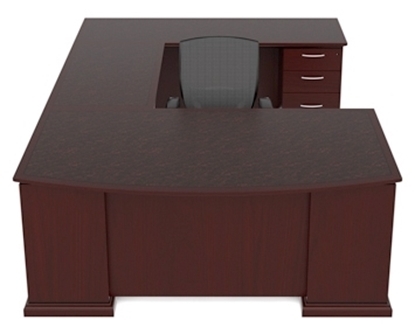 The JSI Brogan is a traditional style U shaped executive desk with corner unit and wood veneer. Features decorative molding, cherry or hand-rubbed walnut work surfaces, polished brass hardware, and ball bearing drawer suspensions. JSI Brogan offers traditional luxury affordably priced with decorative moulding and cherry worksurfaces or hand-rubbed walnut worksurfaces with wood picture frame molding. GreenGuard® certified eco friendly. Free shipping and warranty on all discount office desks. 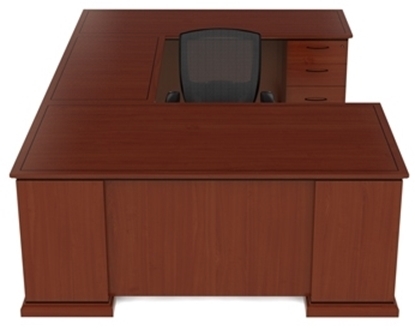 The Sorrento U Shaped Desk will impress in your executive office. This high quality wood veneer desk features plenty of storage, a generous worksurface area, and even organizers to keep your desk neat and tidy.